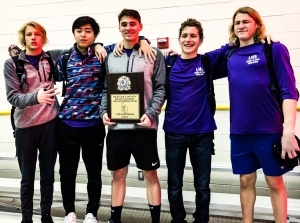 Chamblee’s six-year reign (2013-2018) as the DCSD Boys’ Swimming and Diving champions came an end as the Lakeside Vikings captured the 2019 title at Chamblee last Saturday. Lakeside won its 20th title overall and first since the 2012 season 226-215 over Dunwoody followed in order by Chamblee (160), Decatur (146) and Druid Hills (116). The Vikings had 14 Top 3 finishes and five gold medals in the meet. Senior Sam Witcher got the Vikings off and running in the meet as he won the one-meter diving event for the fourth consecutive year and set the point total record for the third consecutive season with 591.90 break his mark of 545.65 set a year ago. Other individual winners included Kamal Muhammad in the 100 backstroke (53.99) and Zachary Zhao in the 500 freestyle (4:55.08). Chamblee had won six consecutive seasons and the 200-freestyle relay (1:29.75), both state qualifying times won the past five years by Chamblee. The Wildcats also picked up five gold medals and collected nine Top 3 finishes to collect the runner-up slot ahead of Chamblee. Parker Bragg swam a time of 1:49.13 to nip Lakeside’s Zachary Zhao (1:49.33) at the finish to take the gold in the 200 freestyle to get the Wildcats first gold of the meet. Grant Allison won this third consecutive 50 freestyle gold at county with a time of 21.75 and became a six-time county champ with a win in the 100 freestyle (47.37). Nicholas Bragg followed with the gold in the 100 butterfly with a time of 55.19 and the Dunwoody 400 freestyle relay team swam to a time of 3:19.06 to break Chamblee’s five-year hold on the relay title. Druid Hills Liam Bell became a six-time county champion with a pair of wins and set three meet records. He set a new record in the 200-individual medley with a time of 1:53.69 to break the record of 1:55.26 set by Tucker’s Cash DeLoache in 2015. 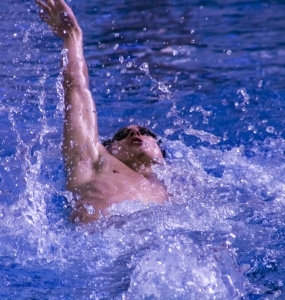 He also won the 100 breaststroke with a time of 1:00.16 for his sixth gold. He won both events in 2016 and 2017. He picked up records in the 50 freestyle (20.97) and the 100 freestyle (45.58). His leadoff leg in the 200-freestyle relay to broke Southwest DeKalb’s Jarrett Tate’s 2006 mark of 21.03. He then set the 100 mark with his leadoff leg in the 400 freestyle relay breaking the mark of 46.62 set by Chamblee’s John Mitchell in 2015.